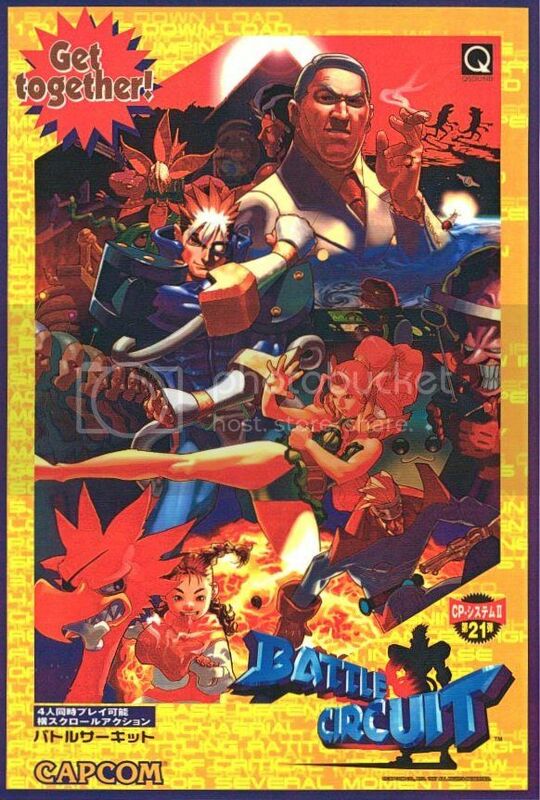 Battle Circuit’s flyer (courtesy of the Arcade Flyer Archive) was absolute Capcom – great art, dramatic poses by the main characters, and bunched together with just enough playful mystery to entice arcade owners into grabbing one of these for themselves. If I ran an arcade, I’d want one, too. By 1997, arcades were already on the wane. Competition from home-based solutions such as PC systems and video game consoles had long eroded the uniqueness that arcades held in their peak when they ruled the scene with flashy graphics, bombastic sound effects, and a wide spread of genres catering to shooters and fighters alike. I miss those days. There’s something about an arcade that’s just innately mysterious, cool, and fun at the same time, each cabinet a passport to places imagined and challenges awaiting the worthy. It’s probably why one of Capcom’s last beat ’em ups came out to a limited release in Europe and Japan and never came over to North America making it another tragedy sifted from the ashes of a dying arcade scene. Battle Circuit was really all kinds of awesome showcasing Capcom’s arcade genius. Battle Circuit ran on Capcom’s custom CPS-2 hardware which was a lot like the CPS-1 but with a number of added features. Graphically, the hardware was relatively similar, but the CPU (which was the prolific Motorola 68000) was cranked up a few megahertz from 10 MHz to 16 MHz. The venerable Zilog Z80 (which acted as the sound CPU once again) also found its way back in and also ran at a significantly higher speed going from 4 MHz to 8 MHz. Two big features distinguished the CPS-2 from the CPS-1 (and which the CPS System Dash, an enhanced version of the CPS-1, crept up to) — enhanced encryption backed with a suicide battery setup and Q Sound chips replacing the Yamahas. The suicide batteries were so nicknamed because of what would happen to the encryption keys should the board be tampered with as part of Capcom’s, and the arcade’s, battle against bootleggers. The memory holding those keys was powered by the batteries and should it lose the charge, it would lose the keys making it impossible to decrypt new game roms (which came packaged as cartridges) turning it into a hunk of useless plastic and silicon. The obvious problem was that batteries don’t last forever, either, and to get the keys back required sending the board to Capcom. CPS-2 was also highly popular among Capcom’s later fighting games such as Vampire: The Night Warriors in ’94, Marvel Super Heroes and Street Fighter Alpha in ’95, and Marvel Super Heroes vs. Street Fighter in ’97. Progear, a brilliant steampunk shmup developed by CAVE and published by Capcom, also debuted on the CPS-2. System-16 has pics of the actual hardware and a gallery lineup of the games released for it at their site. The CPS-2 was also responsible for a few notable beat ’em ups including the pinnacles of Capcom’s Dungeons and Dragons collaboration, Tower of Doom and Shadow Over Mystara. And with Battle Circuit, they would leverage their beat ’em up know-how into a sci-fi mash up of alien bounty hunters, nefarious villains, and world threatening powers. Battle Circuit’s story ran like an anime episode from a 90’s series no one had ever heard of that could have been awesome if it were real. Players got to choose from five different characters and participate in four-way co-op. Like most beat ’em ups, each character was set up with a basic set of moves and a “desperation” special attack for heavy damage at the expense of a bit of health. Outside of those staples, each one had very different fighting habits. 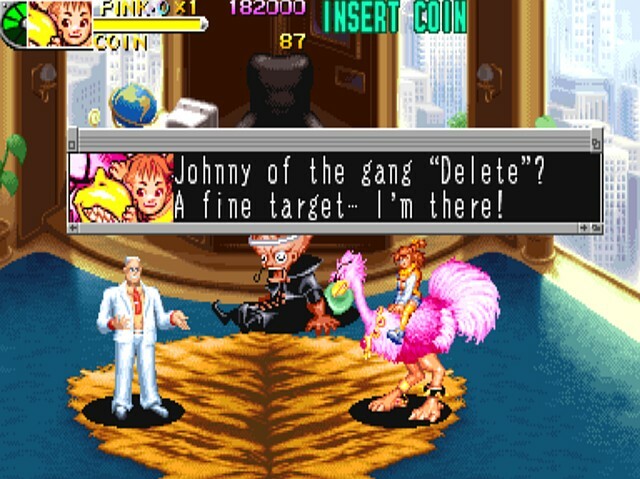 What beat ’em up do you know that has a pink ostrich and a mad scientist as a villain in one game? Battle Circuit! The most alien of the bunch resembles something conjured out from the fevered dreams of Lovecraft’s Elder Gods mythos making him one of the weirdest beat ’em up heroes in the genre. He’s simply called “A.Green” and has decent “punch” moves along with a special, though he’s also a bit slow. He does have a decent grab attack that swings enemies to both sides of him before smashing them free which can be useful in a crowd, but he’s also something of an easy target because of his slow attacks. The most powerful 3.5″ floppy disk in the universe. Next up is a blue bounty hunter simply called “C.Blue” who was had a great special (he lights up with an electrical field zapping nearby foes) and fast, if not overly damaging, attacks including a great “grab and rush” rocket attack. Then there’s “C.Silver” who is like the Fantastic Four’s Mr. Fantastic with stretchy limbs, decently quick attacks, and a solid special attack hitting nearby foes with his power. “Yellow” is a cat-girl with fast attacks and a localized special for getting out of sticky spots. Last up is “Pink” who is a girl riding a giant pink fighting ostrich who has okay speed, decent damage, and a solid special attack. Your white suited boss who is probably taking a cut of your pay to fix the ceiling you just came down through. But no worries! New contract! The game starts off with a big battle on Doctor Saturn’s ship as it falls through the atmosphere after being blasted from orbit. 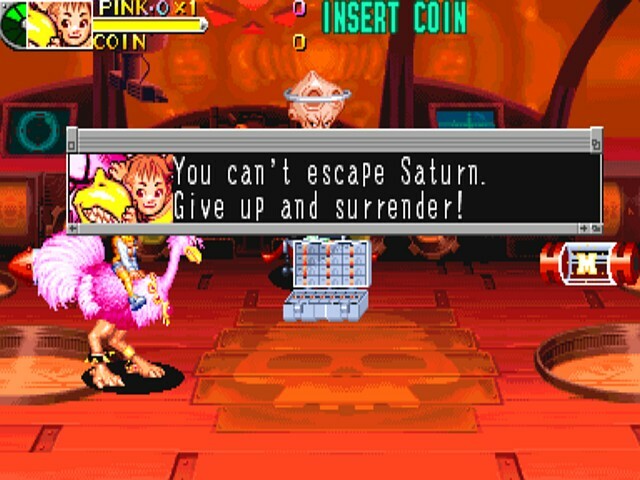 Doctor Saturn, the mad scientist of the game, is also the comic relief along with many of the villains in the game, and soon the gang has him beat down and delivered to their boss. Their next contract pits them against gang-leader Jonny in a wrestling ring where they soon discover mention of a mysterious Shiva system and the disk that could control it. Beat ’em up hijinks ensue. Battle Circuit packs a lot of imagination into every one of its seven stages from Doctor Saturn’s crazy attempts to stop the bounty hunters to the bizarre gangland fodder and backdrops that confront the players later on. It’s literally a wild celebration of beat ’em up action for the sake of being a beat ’em up exploding with racing sequences, strange bosses, colorful attacks, and quite a bit of comic relief scattered throughout the game. Enemies such as overmuscled mega-men called Arnold to femme fatale bosozoku on the streets made up this menagerie of the strange. For fans familiar with Capcom’s beat ’em ups, there’s even a Capcom “smash it” mini-game where you have to break through a glass wall to escape certain death. Q Sound enhanced voice samples, music, and explosive effects backed the pixel art that made this sci-fi beat ’em up hum with action. Small cut scenes told the story in between each stage, seamlessly blending them in with the actual stages. These are two of the bosses you’ll fight later in the game. I’m not even kidding, and neither are Capcom who continue to prove their mettle in bringing some of the most outrageous bosses into any game. The game also included an upgrade system between each stage. Coins found dropped by enemies or discovered by picking up bags or cases of cash can be spent to upgrade your chosen character with new attacks, or even buy an extra life. Continuing from death still retains your score, even after you start back up with a new coin, which wasn’t unusual in a Capcom beat ’em up. 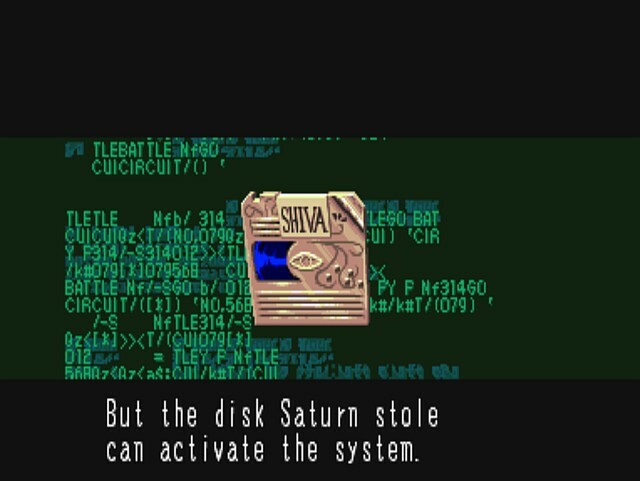 One very interesting thing that the game does at the end is offer the player a choice of fighting a final boss or just stopping the system by pulling the Shiva disk. 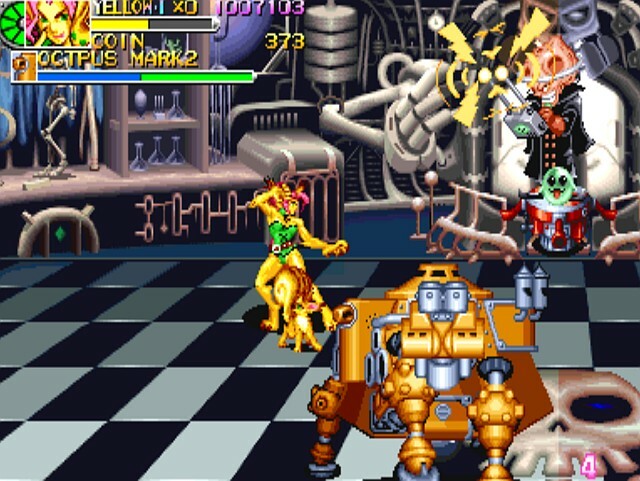 Opting to fight the last boss allows players to rack up even more points if they take on the challenge and slightly changes the ending with a few new scenes orbiting over the planet. It’s a subtle change from the one seen if you don’t fight the boss, but it’s a very unusual — but very cool — level of interactivity offered to players that wasn’t the norm. Doctor Saturn attacks with a remote control robot! Danger! Suspense! And a cat girl that tears up everything! 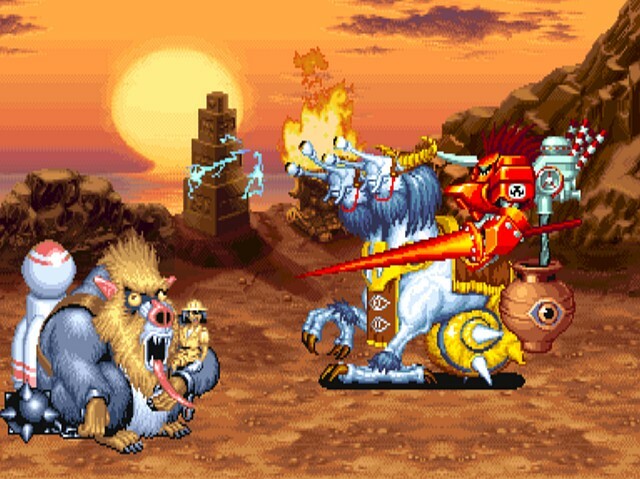 Unfortunately, Battle Circuit never made it out of its tiny arcade audience and Capcom hasn’t seen fit to introduce the game as part of another collection bringing together its famous hits. I’d personally love to see them bring out a “Capcom’s Greatest Beats” volume or something similar, bringing together this and many other beat ’em ups on one disc. Until that happens, Battle Circuit seems destined to be one of those incredible gems that few may have ever heard of.